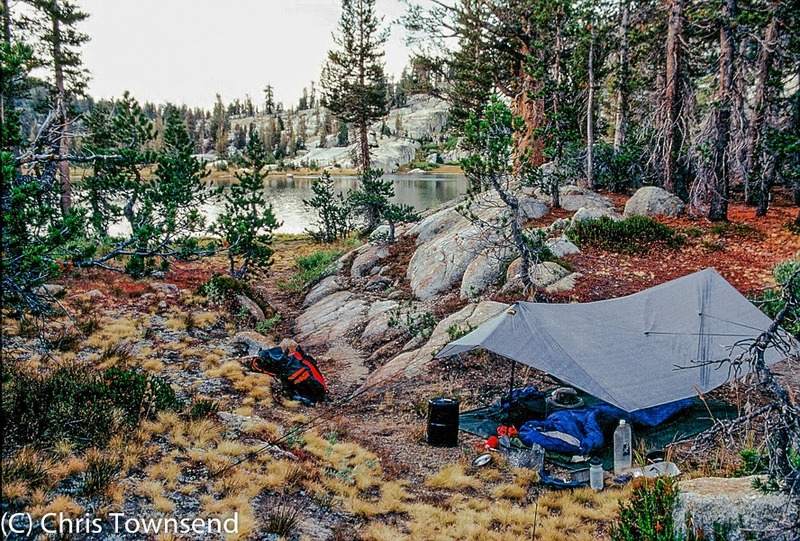 Chris Townsend Outdoors: Ultralight Backpacking? Some Thoughts. Another piece from the past. This is an edited version of one written eleven years ago. Backpacking is about experiencing and enjoying the freedom of wild country, about living in the hills for days at a time. Carrying your home on your back and staying out overnight means you can go deep into the hills, immersing yourself in the natural world. Being self-sufficient for many days also means you can cover long distances without having to leave the hills for shelter or to resupply. But to do this you have to carry shelter, sleeping gear, cooking equipment and all your supplies, which can soon add up to a heavy load that may detract from the pleasure and freedom of backpacking. As anyone who’s hauled a heavy pack long miles across the hills will know the weight of your load can have a profound effect on your trip. The heavier the pack the slower you walk (especially uphill), the more often you need to get the weight off your back and rest, and the sooner you need to stop and make camp. Too heavy a load and your back and shoulders may ache, your hips feel sore and your legs weary. Every backpacker quickly learns that paying attention to the weight of their gear can make a big difference to enjoyment and comfort. The average UK backpacker, with a selection of the gear found in every outdoor shop, probably ends up with a pack for three-season use that weighs between 25-40lbs/11-18kg without food and water. At the end of last year’s TGO Challenge (2002) I hefted many of the packs lining the outside of the Park Hotel in Montrose. My pack wasn’t that light – it weighed around 32lbs/14kg – but all the packs I lifted weighed more. Whilst they may choose gear that doesn’t seem too heavy or bulky most backpackers don’t check the weight of every item let alone, to use the old cliché, drill holes in their toothbrushes. As long as the pack doesn’t feel too heavy it’ll do seems to be the general view. Many people put together their kit over a number of years without consciously thinking of the weight of every item and without looking for the lightest option. How much does your pack weigh? All those Challengers in Montrose were carrying standard backpacking gear, as I was myself. It’s the stuff that’s well proven, and, while the names and details may change, the basic items have weighed the same and given much the same performance for decades. Recently though a new philosophy has arisen, inspired to a great degree by Ray Jardine, most recently in his book “Beyond Backpacking”, who argues that there’s no need to carry heavy loads, that pack weights can be cut drastically without compromising safety or comfort and that by doing so backpacking can become more enjoyable. Ultralight backpacking means cutting every possible fraction of weight off every item. The resulting loads are more like daypacks than backpacks. By choosing the very lightest gear and only carrying the absolute essentials ultralight backpackers can get the weights of their basic loads (that is, without food and water) to well below 20lbs/9kg. Indeed, 20lbs/9kg could be said to be the upper limit of an ultralight load, going up to 30lbs/13.5kg with food and water. Mountain marathon runners have carried very light loads for years of course. When I took part in such events back in the 1980s my pack usually weighed 11-12lbs/5-6kg. Mountain marathons only involve one night out however and the sole aim is to cover the course as quickly as possible. To do so competitors are often prepared to put up with discomfort that they wouldn’t accept for a longer trip where speed and distance were not the only concerns. I certainly never considered carrying the light mountain marathon loads on backpacking trips, feeling that having such a light pack wasn’t worth the disadvantages. Now however proponents of ultralight backpacking say you can stay out for weeks and even months and still be comfortable. Backpackers have travelled ultralight before now. When Hamish Brown made the first continuous traverse of the Munros back in 1974 his load averaged 23lbs/10kg including food. Some of the ways he achieved this low weight are very similar to those used by ultralighters today. His pack had no frame, hipbelt, padding or pockets. His tent was a single skin nylon one, weighing just over 3lbs/1.3kg. And his sleeping mat weighed nothing – he didn’t have one. “Except on snow these are just bulky extras”, he wrote in his account of the trip (Hamish’s Mountain Walk). As well as the big items he paid attention to the details too, using his pan lid as a mug and sharpening the edge of his spoon so that he didn’t need a knife. For part of the walk he used a solid fuel stove. Jumping a decade to 1984 we find Colin Fletcher writing in the third edition of his seminal backpacking handbook “The Complete Walker III” that “a tide race has set in toward ultralight gear”. In fact that tide receded for over a decade before surging forward again in the last five years. Wanting to see what it was about Fletcher made an ultralight trip with a load that weighed 15lb 11oz/7kg without food and 19lbs/8.5kg in total. That included a frameless pack weighing just 1lb 6oz/625 grams and a tarp weighing 1lb 4oz/567 grams. Fletcher found that “the light load was a joy, especially uphill and obstacle-crossing”. However he remained concerned about the performance of ultralight gear in severe conditions, writing that “if you know you may find yourself alone in a mountain storm, three days from roadhead, then false weight-economy could prove fatal; and you had better forget the gossamer game and lean heavily towards Old Wave ruggedness”. Way back when recreational backpacking was in its infancy there was an interest in lightweight travel too. In his 1921 book “Camping & Woodcraft” Horace Kephart describes a summer backpacking load weighing 18lbs 3oz/8.25kg without food. This included a 2lb 4oz/1.02kg pack and a 3lb/1.3kg blanket that was used as back padding in the pack as well as for sleeping plus a 2lb 4oz/1.02kg tarp and, for cutting wood for fires, a 12oz/340 grams tomahawk. Kephart calls this load medium weight. He also describes a “featherweight” 10lb/4.5kg load that includes pack, tent, down sleeping bag and spirit stove. Interestingly he says this is an English system and not suitable for American wilderness. Today the question is whether American ultralight gear is suitable for British conditions. The attractions of a light load are obvious. Backpacking with what feels like a daypack means you can go further with less effort and with little risk of sore shoulders, hips or back. It also means greater mobility, especially when crossing rough terrain, making the walker a light dancer rather than a lumbering dinosaur. The load doesn’t impinge on your consciousness either and you can enjoy the hills without noticing the weight on your back. Proponents of ultralight backpacking argue that it can be safer too as a heavy load can lead to injury as it makes you less mobile and puts more stress on your body. With a light load you can move fast if the weather changes, descending far more rapidly when a thunderstorm erupts or strong winds blow in than you can with a heavy pack. Those who favour more standard loads respond to the last by saying that you have to move fast with an ultralight load as you don’t have the gear to cope with a storm. And if an injury slows you down or even forces you to stop you could be in trouble with ultralight gear. This is a big concern. Not every one is fit or nimble enough to move fast in bad weather. It is possible to carry an ultralight load without compromising on safety by carefully selecting items suited to the conditions but this requires experience and skill. Heavier loads can also mean more comfort in camp. 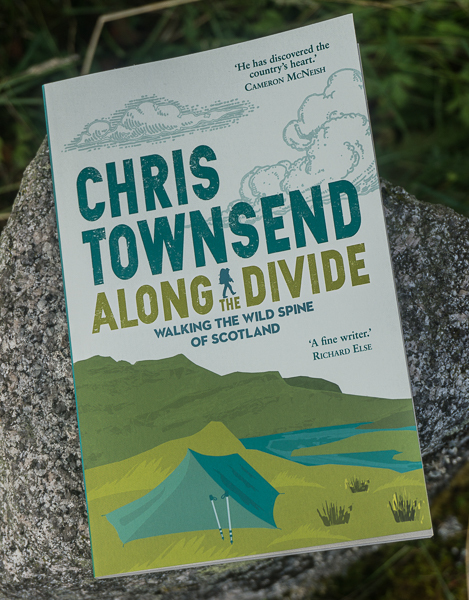 A roomy tent to protect you from bad weather and midges, a thick self-inflating mat for a comfortable nights sleep, candles or other lights for illumination, books to read and luxury items of food and drink can all make for enjoyable camping and are worth the weight to many people. Those who are happy with standard loads say that backpacking is about far more than load carrying, that there are reasons to go backpacking that are far more complex than just wanting to cover ground easily and quickly. But light loads are worthwhile whatever distance you cover or speed you travel, say the ultralighters, and you don’t have to be a fast mover to appreciate a light pack. A big concern with ultralight gear is that it won’t last. With modern materials this isn’t really a problem as long as items are well made and aren’t abused. Ultralight gear doesn’t just involve using lightweight materials either. It also means simple designs with minimal features. Much standard gear is too complicated and made from unnecessarily heavy materials. Packs are a classic case. For backpacking 1000 denier heavy duty fabric that will withstand being hauled up rocky gullies just isn’t needed. Neither are masses of pockets and compartments. These may be nice for organising your gear but every zip, flap and panel of fabric adds weight. And for loads under 30lbs/14kg complicated frames and back systems are unnecessary too. Sometimes ultralight fabrics can be stronger than heavier ones. The silicone elastomer nylon used in the lightest tents and tarps is actually much tougher and longer lasting than the polyurethane-coated nylon and polyester found on heavier tents. Some old materials are durable too. An ultralight down sleeping bag will last far longer than a heavy, bulky synthetic one. Waterproof clothing is probably the only area where ultralight garments won’t last as long as heavyweight stuff. It’s still tougher than the standard weight garments of a few decades ago however and much less expensive than top quality heavy garments. Also, if you wear a windproof top and trousers in breezy, showery weather and save your rain gear for continuous rain it will last much longer. The ultralight approach is likely to appeal more to those with a Spartan approach to backpacking than to hedonists. It also appeals to those for whom the walking is more important than the camping. If you want to cover high mileages or walk for many hours each day then a light load is obviously a good idea. And if you want to spend hours in camp relaxing and watching the landscape and the wildlife then carrying more can help ensure comfortable camps. However light your basic pack weight food, fuel and, sometimes, water have to be added. With care most people can get food down to around 2lbs/1kg a day. Some can manage on 1.5lbs/680 grams though this is cutting it a bit fine for walks of more than a few days. It’s easy to carry more than 2lbs/1kg if you don’t choose food carefully however. It’s not just the type of food though but also how many days food. Once you go beyond two or three days the weight of food adds up. At around 2lbs/1kg a day a week’s food weighs 14lbs/7kg. And when you start adding those weights to a pack it ceases to be ultralight. 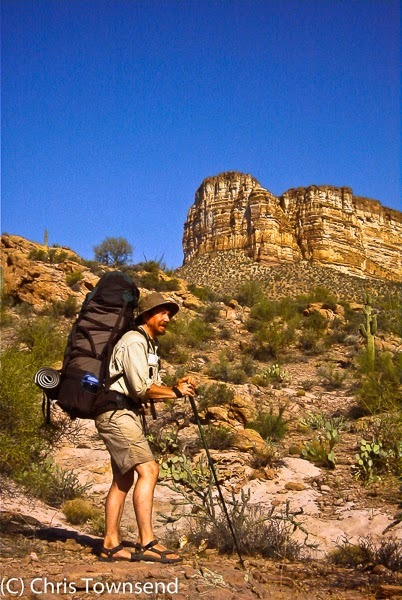 On the Arizona Trail in 2000 I travelled for a week or so with another hiker who had ultralight gear. His basic pack weight was 12lbs/5.5kg. Once he added six days food his pack weight doubled. Much more than a weeks food and however ultralight your basic gear your total load will not be ultralight, especially when you add in stove fuel and any water you have to carry. The answer to the problem of food weight is to resupply more often. This was Ray Jardine’s solution in his first ultralight hiking book, “The Pacific Crest Trail Hiker’s Handbook”. He argued that by carrying a very light load a hiker could cover more miles per day with no extra effort and therefore travel between supply points more quickly, thus reducing the amount of food that had to be carried. This is fine if you’re happy to do high mileages and to leave the wilds every few days. However staying out for long periods of time with no contact with civilisation is appealing and can make for a deeper contact with nature and a more satisfying experience. For some of us it’s worth the extra burden, at least some of the time. If you have to carry much water then the weight of your pack will rocket. Luckily this is not something we often have to do in the UK. 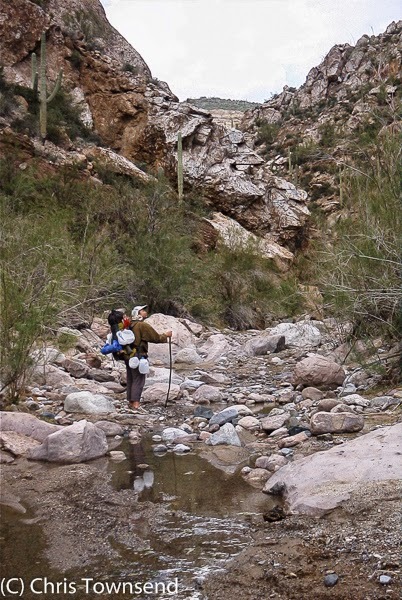 However on the Arizona Trail last year I had to carry up to three gallons at times, which, at 30lbs/13.6kg including containers, made a mockery of going lightweight never mind ultralight. Large amounts of water can also destroy the comfort of ultralight packs. When Jake, the hiker I travelled with in Arizona, had to add three gallons to his load along with six days food his ultralight 12lb/5.5kg pack became a 54lb/24.6kg monster. His simple frameless pack simply couldn’t handle this weight and felt very uncomfortable, while my heavy fully specified one felt fine, even though my load was some 13lbs/6kg heavier. To go ultralight on a long walk then you need to be able to resupply with food frequently, certainly at least once a week, and not carry much water. Ultralight backpacking is not something most people can simply undertake without thought or practice. It’s probably actually easiest for those who’ve never done any backpacking before as they don’t have preconceived notions as to what equipment should weigh or even look like. However a really ultralight load is not for novices. To be able to cope safely in bad weather with minimal equipment you need some basic walking and camping skills and experience. To those used to standard weight loads and conventional gear ultralight techniques and equipment can seem off-putting, even dangerous. 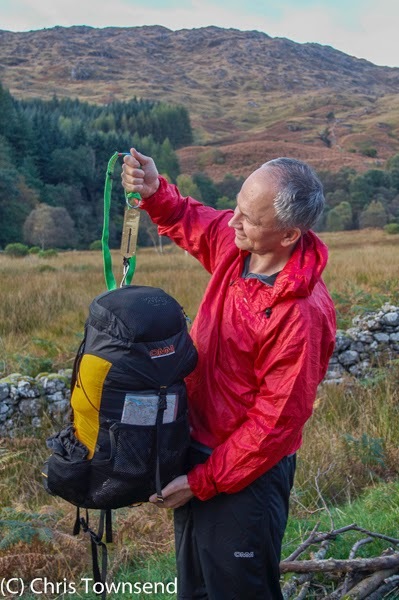 Certainly I wouldn’t advise even an experienced backpacker to head off into the hills with a sack full of ultralight gear without having tried it first close to home and learnt how it works. This particularly applies to tarps. And until you know the limits of your equipment it’s best to err on the side of caution and take that extra item of equipment just in case you need it. If the ultralight approach appeals you can start by going through the gear you already have and ruthlessly pruning any excess weight. Just putting everything on the scales can make you realise just how heavy some items are and make you determined to replace them. Think about what you really need too. As Ray Jardine says, not taking an item reduces its weight by 100 percent. Replacing heavy essential items with lighter ones is the only way to really reduce the weight though. 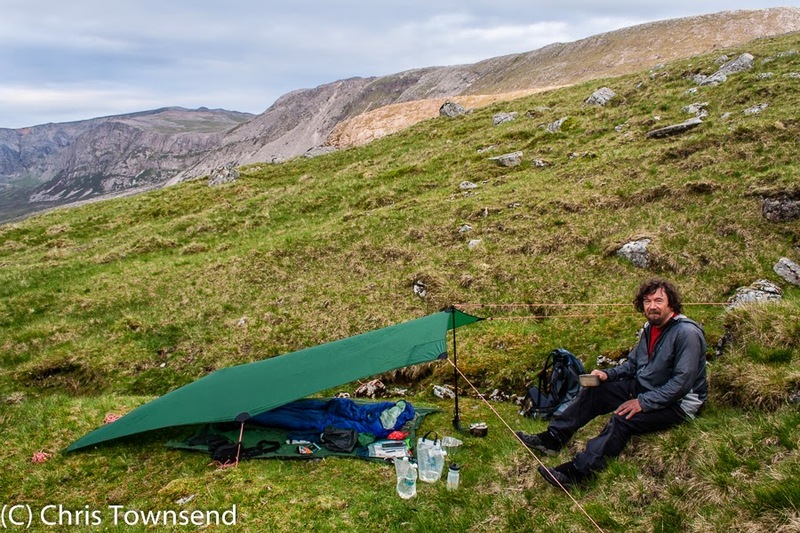 According to Hamish Brown: “The biggest weight accumulators are things like waterproof trousers and jacket, bivy bag, tent, rucksack, stove and sleeping bag”. Get the weight of those down and your whole load will be much lighter. You don’t have to replace everything at once though. Ultralight gear can be integrated with standard gear. My first step towards ultralight backpacking was when I first changed from heavy boots to very light shoess. 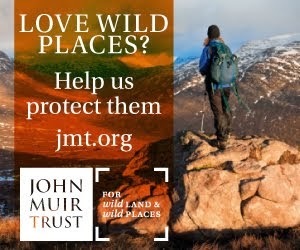 That was the only change I made for over a decade but then I made two long trips (a round of the Munros and Tops and the Arizona Trail) on which, for very different reasons (the amount of ascent on one, the amount of water I would have to carry on the other) heavy gear seemed inadvisable. On both those trips I reduced my basic loads by some 10-13lbs/5-6kg from what I’d carried on previous long walks, a significant amount. Ultralight backpacking can be described as a state of mind, an attitude, as much as an activity. Those with an ultralight mindset will always consider the weight of an item first, putting this ahead of function, performance and durability. They will also always question whether an item is needed at all. The ultralight point of view looks at limiting the weight of the load as the first requirement. Conversely if you favour the standard approach you will, in the words of Colin Fletcher, “launch yourself along a gear-selecting curve that opts for safety and comfort” so that “no matter how hard you think you are paring away at each item your choices are calibrated for a “heavy” regimen”. Finally, remember that no way of backpacking is better than any other, despite what zealots on either side may say. It’s a personal choice. It’s what suits you and your desires and aims and it’s what you are comfortable with that matters. 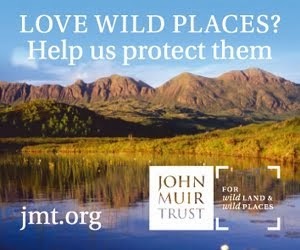 After all, the reasons for going out there are to have fun and to enjoy the natural world. How you do that is up to you. Eloquently written Chris. If you want to go ultralight, you really do need to resupply frequently. Most big UL backpacks hit the wall at a maximum of 40 pounds. If you go heavier and/or have to carry extra water, you need to be prepared to suffer sore shoulders and discomfort or wear a pack with a stiffer frame and more shoulder padding. I find that a UL mindset helps though on long trips where I need to carry 2+ weeks of food because I can reduce the weight of my other gear so much to the point where 80% or more of the weight I carry is food. This is actually a big help and one that should not be overlooked. "However staying out for long periods of time with no contact with civilisation is appealing and can make for a deeper contact with nature and a more satisfying experience. For some of us it’s worth the extra burden, at least some of the time." I heartily agree! Agree about going lighter to make your outdoor experience more pleasurable, however the idea of going light to cover ground faster doesn't appeal to me, the joy of taking in your surroundings as they constantly change, and listening as well as looking at wildlife are the most important part of travelling through the wilds for me personally, there's nothing better than waking up in camp to the sound of birdsong, and a small stream bubbling nearby. Great article that really hits home for me- all my trips are in excess 10-12 days without resupply and the need to be in the wilderness for long periods without seeing another soul far outweighs any desire to achieve a greater mileage. The difficulty these days is in finding articles that candidly address a balance of ultralight, lightweight, and traditional equipment. This is particularly true of hiking packs- every hiking pack is comfortable to its recommended weight- but most of us know how rapidly a pack becomes uncomfortable, in a very linear fashion, as you add on more kgs. This is a super post, thanks Chris. One thing you didn't touch on much is that going lightweight can be expensive. Titanium cooking pots are expensive, as are good down sleeping bags, for example. I wonder how many people have made the mistakes I have when I took up backpacking again after a 30 year absence, trying to keep the costs down and making poor gear choices as a result. Then do you waste money and be environmentally unfriendly by changing stuff? I guess the answer is to read before buying and talk to others. I made the mistake of getting your Backpackers Handbook after I made poor choices of sleeping bag, pots, tent, etc and so learnt costly mistakes the hard way! As I said a super post. Thanks again. that look like so cool!